Posted on August 29, 2010	by Derek "Gamer Crash"
Here’s the next installment of Making the Case, where I present the facts and you make the decision. Up this week: Split/Second for the Xbox 360, Playstation 3, and PC. Here lies another Red Dead Redemption casualty. It’s a shame as well, because what we have here is a fantastic arcade racer. Tell me, what isn’t appealing about racing around and causing taxis to explode or having a plane land on a runway as other racers try to avoid getting smashed by it? The game premise is simple. Finish first in a race event against other racers. It’s the gameplay hook that will keep you coming back for more white knuckle racing. You’re a driver on a very popular show called Split/Second. It’s a racing style tournament where you build up a meter by driving dangerously to unleash “power plays” on the other racers. These include simple things like explosions, collapsing overpasses, opening short cuts, and bigger things like causing a boat to crash into the racetrack, or even causing a dam to explode. The bigger power plays, while they take longer to gain, cause the track to change in some way. So each track can have anywhere from 2 to 5 alternate routes to significantly change the track layout. Black Rock Studios gives you a ton of car options. The bad part is that the car companies are fictional but you may recognize some of them as they are modeled on real cars. There are three classes of vehicles and all three can be in a race at one time. You have the truck, the sports car, and the muscle car. Each have strengths and weaknesses and are suited better for certain modes. Speaking of modes, there are 6 different ones to participate in. You have your standard race mode in addition to Air Strike, Air Revenge, Survival, Detonator, and Eliminator. Air strike sees you trying to outlast a helicopter trying to wreck you three times with missiles. It sounds crazy and it is. You gain points for dodging missiles and staying out of harms way. Once you wreck 3 times the event is over and your points are tallied up to see where you rank. Air Revenge is very similar only this time, successful dodging will allow you to throw back missiles at the helicopter. Destroy the helicopter as fast as possible to see where you finish amongst the other racers. Survival is an event ripped straight out of Terminator 2. You’re tasked with passing by trucks and other cars. Sounds easy right? Not so fast, these trucks dump explosive barrels that’ll wreck you in 1 hit. Pass by a truck and gain points and extended time. Wreck 3 times and the event is over. Detonator is absolutely insane. Basically, this is a time trial event with a twist. As you’re racing, power plays automatically go off around you. Makes fr some exciting racing that’s for sure. Finally, Eliminator is a straight race with the last place car getting eliminated every 30 seconds. Don’t fall behind in this one! The graphics are incredibly good in this one. The colors are vibrant and the light bloom is really well done. The car models look great and also take on damage realistically. The explosions, demolitions, and their after effects are a great visual touch as well. For the level 3 explosions, you can also press a button to replay the carnage if you want. The great thing about this game is that the HUD (Heads-Up Display) is actually on the back of the car. This is genius because now you don’t have to take your eyes off of your car or the road. Everything you need is right in front of you in a handy spot for your eyes. On the negative side, there are 12 maps total (though Black Rock is working on DLC so maybe more will be added) so there isn’t a ton to race on even though each map has variations due to the route changer power plays. So you have the downtown area, the docks, the canyon, and also the power plant. Each region has a bunch of maps featured there. Also, there is some extreme rubber band AI going on. I don’t know if it’s the programming or the fact that you can draft other cars from such a great distance away but in this game, no lead is truly safe. It also seems that the better the car that you use, the tighter the competition becomes. The championship races are the exception as every car in those races already have top tier cars, so they can’t improve any more. 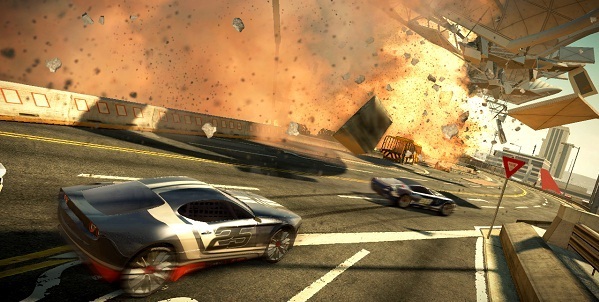 Split/Second offers an intense racing experience. You won’t realize it till after the race that you stopped breathing after lap 1. If the cheap AI gets to be too much, you can head online for great fun against human opponents. It’s too bad S/S didn’t sell better, as it’s a fun experience that deserves to be played. It gives the player a unique feeling that I wholly recommend. This entry was posted in Making The Case and tagged Opinion, PS3, Xbox. Bookmark the permalink. I like the format on this article. I am going to try using it on my site.